The AMON computer systems are hosted by the Research Computing and Cyberinfrastructure (RCC) group, a unit of Information Technology Services at Penn State. The dual AMON servers are housed in separate secure facilities, providing system redundancy. Incoming events are processed in a manner described in the figure below. The final system will feature a clustered database with nodes securely distributed across the Penn State campus for redundancy. Each server will receive the incoming events and process them in an identical manner. The first to complete the processing task will write the event to the AMON database. The incoming event also triggers a search algorithm, which looks for coincidences in some time range [t1, t2] where t2 is typically the time stamp of the new event. 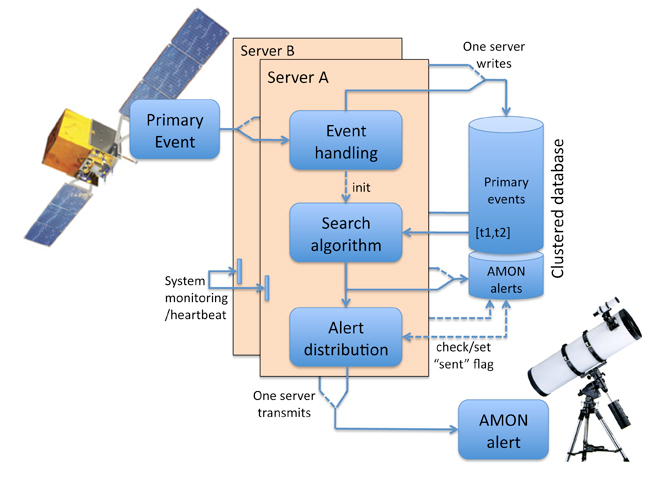 If a significant correlation is found, an AMON event is generated by each server, but only the first to complete the analysis will write to the database. Typically the significance of the alert will determine to whom it will be distributed, with the distribution task again being performed by the first available server. While the database is locked out by the first server, it sets a “sent” flag that tells the second server not to issue the alert. Each server monitors the other’s status and can alert operators to a problem.